CHARLIE is our wonderful “C” type personality! The letter “C” represents the word “Cautious.” “C” type personalities enjoy having a routine and schedule. They are usually very good students and like things that challenge their mind. Their communication style is A to Z, which means that, details and planning are very important to a “C.” That is why they ask so many questions. The “C” type personality prefers to do things that have been planned out especially if it involves a large group of people. They are very comfortable being alone and working independently. They appreciate quality more than quantity. God bless the Reserved/Task-Oriented “C” type personality! 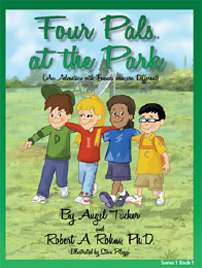 Four Pals at the Park features David, whose primary traits are Dominant, Demanding, Direct, Determined, Decisive, Doer. David directs his friends through a play date at the park where they enjoy playing on the playground equipment and sharing a snack together. 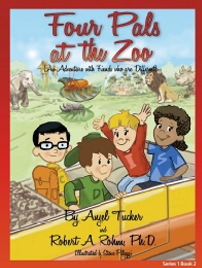 Four Pals at the Zoo spotlights Iris, who is the Inspiring type. Her other qualities are Influencing, Involved, Impressive, Interesting, Imaginative, and Impulsive. Iris is a bundle of energy who is all about having fun and that is exactly what she and her friends experience as they visit all of the animals at the zoo. Four Pals at a Party highlights Summer, who is more reserved than David or Iris. She is known as the Supportive, Steady, Stable, Secure, Sweet, Shy type. 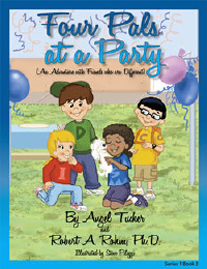 In this book, Summer is having a birthday party and in typical fashion, she thinks of others before herself. 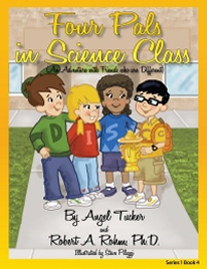 Four Pals in Science Class focuses on Charlie who is Cautious, Competent, Careful, Correct and Conscientious. The setting is a science class in which each of the children is instructed to build a volcano for a contest. Charlie carefully researches volcanoes before he begins his project because he wants to be accurate.